Adopting a boss or adopting a book at St George’s can make an unusual gift or mark an anniversary or other event in your life. 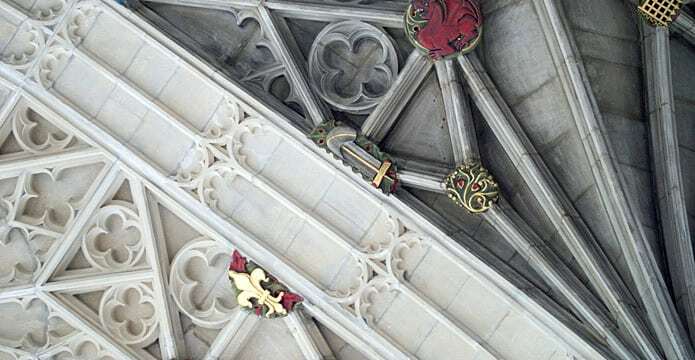 The vaulting of St George’s Chapel has a great wealth of heraldic, royal, floral and religious bosses carved in stone at the points where vaulting ribs meet. In all there are 675 bosses ranging from small initials to large, elaborate pendant bosses which hang vertically from the very centre of the Quire’s vaulting. Cleaning of the vaulting and bosses is part of the Chapel refurbishment scheme and the photo shows the contrast between completed and yet to be tackled sections. In the Chapel’s archives are over 6,000 rare books which date back many centuries and which cover an extraordinary breadth of subjects. 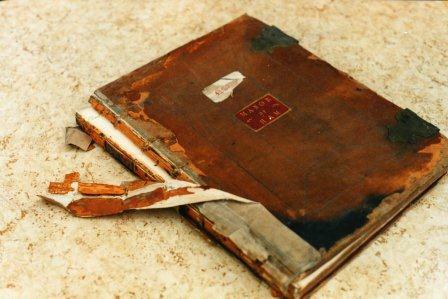 There is an opportunity to adopt books within varying price bands depending on which century the book dates from; there is also an opportunity to adopt manuscripts. The conservation of books for current and future scholars depends on the Adopt-a-Book scheme.